FILE - Protesters gather to call for humanitarian aid for Venezuela, in Madrid, Spain, Feb. 23, 2019. The crisis in Venezuela is causing divisions between the Trump administration and EU governments, which have failed to back Washington's call for tougher sanctions against President Nicolas Maduro. Disregarding evidence presented at a NATO summit last week indicating that Maduro is digging in with the aid of Russia, the EU decided against widening Venezuelan sanctions during a foreign ministers’ meeting Monday. “The EU is against implementing sanctions on Venezuela as a country,” said Spanish Foreign Minister Josep Borrel at a press briefing following the meeting. He left open the possibility of applying individual sanctions against some members of Maduro’s government. Last week, the United States expanded sanctions to block Venezuela’s oil exports by targeting its tanker fleet, declaring that 34 of its vessels could be embargoed or seized through new measures announced by the U.S. Department of Energy. Europe, on the other hand, continues receiving oil from Venezuela despite crippled production. Spain’s oil company Repsol recently reached an agreement with the cash-strapped Maduro government to pay down the company’s $2 billion investment with added shipments of oil. The U.S. stopped importing Venezuelan crude in January when President Donald Trump broke off relations with Maduro and recognized the opposition parliamentary leader, Juan Guaido, as the country’s legitimate president. Assets seized from the Venezuelan oil company PDVSA are being channeled into opposition bank accounts, according to the U.S. State Department. But almost 100 Spanish companies continue operating in Venezuela, including one of Spain’s largest banks, BBVA, which could be vulnerable to future sanctions. Borrel has said he discussed Spain’s financial stake at a meeting with U.S. Secretary of State Mike Pompeo last week in Washington and also complained about administration plans to toughen the embargo on Cuba. Mariana Elias, 27, shows her Venezuelan and Spanish passports at the Simon Bolivar International Airport, La Guaira, Venezuela, Jan. 14, 2019. Spain’s large presence in Venezuela — where the Spanish expatriate community numbers about 250,000 dual nationals — makes Madrid the lead government on EU policy toward the Latin American country. Italy and Portugal also have substantial expatriate communities and commercial interests in Venezuela including investments by Italy’s oil company Eni. The Trump administration used last week’s NATO summit to argue Venezuela presented a new threat from Russia, which has supplied sophisticated arms and military advisors to revamp Maduro’s air force, armored units and special forces. Russia is also building a base for cyber warfare on the Venezuelan island of Orchilla, according to the Pentagon. bout 100 Russian military personnel arrived in Venezuela last week on board Ilyushin and Antonov transports. "We will continue military-technical cooperation with Russia in [the] future," Venezuelan Foreign Minister Jorge Arreaza was quoted as saying Monday by Russia's TASS news agency. Borrel has said Russia’s presence in Venezuela is small and should not constitute a “problem” for NATO. Spanish Prime Minister Pedro Sanchez has said that Spain would “roundly oppose” any U.S. military action against Venezuela and that he would urge the rest of the European Union to do the same. Previous conservative Spanish governments were sharply critical of Venezuela’s leftist course and pushed for EU sanctions against Maduro officials. But Sanchez was slow to recognize Juan Guaido despite personal appeals by the U.S. ambassador in Madrid, who expressed his frustration in private meetings with top officials, according to the newspaper El Pais. 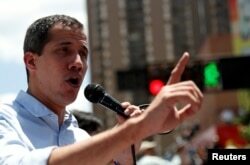 Guaido also publicly urged Spain to be more “aggressive” with Maduro. Last week, the Spanish socialist group in the European parliament voted against a resolution condemning Maduro even as he announced plans to arm his civilian militias called Colectivos. The U.N. Human Rights office says it is investigating more than 200 extrajudicial killings in Venezuela, and last week’s arrest of one of Guaido’s closest aides indicates Maduro may be preparing to move against his rival. Spanish officials say they are doubling down on efforts to find a political solution through negotiations between Maduro and Guaido. Speaking from Brussels Monday, Borrel said Maduro had requested an “activation” of the EU-led Montevideo group, which includes Mexico, Uruguay and other Latin American governments offering mediation. In a press release Monday, the State Department said Special Representative for Venezuela Elliott Abrams will meet with Portuguese and Spanish officials in Lisbon and Madrid this week "to discuss the deteriorating situation in Venezuela." The statement said "the United States, Portugal, and Spain support a Venezuelan-led transition toward free and fair elections."